The integrity of the shell is very important in an Energy Star home. Attention to detail during the framing stage will save time and money later during the shell sealing and insulation procedures. There should be a continuous gasket or sill sealer between the top of foundation wall and bottom of the sill plate. There should be no gaps between the rim joists. Exterior walls should be 2X6 if your budget allows. This allows for R19 versus R13 or an increase of 50% insulation value. Exterior wall corners should be open for insulation purposes. 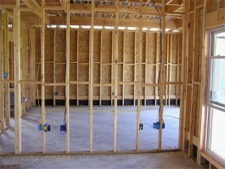 Where interior wall partitions meet exterior walls they should be open framed. Make sure to follow manufacturers window installation procedures. This will include wrapping the opening and a bead of sealant under the nailing fin. Roof rafters should be attached to the top wall plate so as to allow enough area for insulation under the baffle. If using trusses consider a raised heel truss. There must be a minimum of 300 watt savings on light fixtures or appliances. This can be done using six compact fluorescent bulbs. Recessed light fixtures that are connected to unconditioned areas should be IC rated and sealed. There should be at least one bathroom fan capable of exhausting 90CFM with a sone rating of 1.5 or below and operated by a timer switch. Domestic hot water tanks should be direct vent or closed combustion and have a energy factor of .61 or better.